You are here: Home / Great Deals / Yet Another Coupon Lesson! Now, it’s time for me to take my kind, nice, “roll with the punches” couponing attitude toward cashiers and set my hat strongly on my head and get that “Look over my the top of my glasses” stern! We discussed (actually, I discussed, you read) my encounter a few weeks ago with the new “coupon friendly” (<—- read with sarcastic voice) Family Dollar. So, back to today, I go in with 10 $1/1 ANY Reach Toothbrush from 5/16 RP and I collect 10 $1 Reach Toothbrushes. I get to the counter and the girl scans the first coupon, it beeps – now, I was just sure this wouldn’t be an issue, because it was not internet printed – so, she calls a woman over and says “What do I do, it won’t scan?”, she had only tried once, but, ok… The woman she called over was on her way home, she took the coupon and looked at the back – weird, What was she looking for on the back…… Then she told the girl how to take them off manually, so the girl did the first one and the woman said, “yeah, just do that.”, then the girl says “She’s got 10 of them.” So, the woman takes off the next one and then, she says to me “I need to see what the limit is”, she proceeds to read the coupon. I immediately know where this is going. But, I wait for her to say it, she says “It says 1 per purchase.” There it is… she said it, I said “Yes, I am purchasing 1 toothbrush with 1 coupon for each.” She continues to read, she finishes reading and repeats, “It says 1 per purchase.” And I repeat “Yes, I am purchasing 1 toothbrush with 1 coupon for each.” , “NO!” She says, “a purchase is this!” And she shakes my bag of toothbrushes at me. I said, “A transaction is the entire sale and a purchase is 1 item, I am purchasing, I do this at other stores all the time and….” She quickly cuts me off, rolls her eyes and says, “I’M SURE YOU DO!” So, I shut up, she then says, “I’ll do it this time, but I am going to call my District Manager.” I smiled and said “Good, thank you. She finished deducting all of my coupons, and was taken aback by the zero balance – I just knew I was in for round 2! lol But, no, she was ready to go home, so she left and so did I. Now, I then called the District Manager, told him I was tired of being treated like a criminal EVERY time I go in there with coupons. He wasn’t very sympathetic and went on the whole thing about internet coupon fraud, as I reminded him twice, these were cut from the Sunday paper. So, the saga will continue and I will see what happens next, if I don’t get a response back after he speaks with his manager, I will be calling corporate. Finally, I went to Kroger immediately after and the cashier was a gem, I picked up the wrong detergent she kept smiling – genuinely and took all my coupons like a pro and was very helpful and extremely friendly. I made sure to tell her manager what a great employee she was. The lesson? Always, always make sure to commend the ones who do a good job. Take a moment and stop at the customer service desk and tell the manager on duty, what a good job they did. When I have a lot of coupons, if they were good, I always tell the cashier what a good job they did, too. Today as always the good cashier made my day nicer after the other experience! I agree. 100%. I always try to praise the good ones…sometimes it seems they are few and far between. I’m sorry you had a bad experience at Family Dollar. I sympathize and I can relate via a meh experience at Walmart today. @JamieAnne: I am sorry to hear about your experience at Wal-Mart. I guess the bad ones always make us so much more appreciative of the good! I was at Walmart a few weeks ago with a bunch of Nivea coupons (13 to be exact), and had the hardest time. The cashier was awesome about it… it wasn’t until the supervisor came over to approve the transaction that the situation got ugly. I got talked at for not knowing their coupon policy (which the corporate website doesn’t state I can’t use more than one duplicate coupon) and was told that the cashier would get into trouble because of ME! Outrageous! So I got online and filed a complaint against the supervisor. The store manager called me and proceeded to tell me that I was wrong for using that many coupons (one per purchase and one per transaction went over her head), but that the supervisor was also wrong for telling me it was my fault. Lets say, I’m never going to that Walmart again! @Natasha Wheatley: Ok, that IS NOT their corporate policy! They are mistaken.. I would call corporate again until someone educates the manager. Sorry that happened to you! That experience would not be fun and might be embarrassing if there’s a long line! I have not tried using coupons at Family Dollar as of yet. Hopefully I don’t run into this kind of problem. My couponing experiences have all been positive so far. Sorry to hear how you were treated. @Kristen: Thanks, Kristen, it isn’t the first time and it won’t be the last I am sure. It all boils down to a lack of proper training. They don’t understand and haven’t been properly trained. I pray your good experience streak lasts!! @Christine: I try to think about the cashier’s too, like have they had a bad day, what’s going on at home that may be spilling over. I know when I went to the Kroger after the Family Dollar all I could think about was the bad experience and I was sooo happy to see the cashier and her attitude, but, I don’t think I expressed it at the time because all I could think about was the bad experience. So, we just have to know there could be other reasons they are not being “nice” to us at that time. Last Friday, it was a cashier and assistant. They questioned the $2 internet coupon on Ecotrin. Even though it clearly states that it’s good on “any Ecotrin product” (making it free) he wanted to see what the picture was. Knowing that the wording is the important part I pointed that out again and he insisted that if he couldn’t see the picture that it wasn’t valid. When I stood firm, he said “if you want to use a coupon like this again, you will have to blow it up so I can see the picture!” I just about laughed at his ignorance but kept it down. If they are so concerned about coupons why not at least find out what is truly illegal? 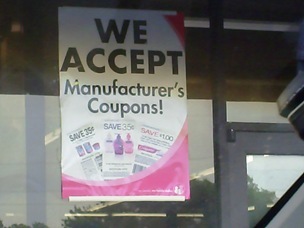 Like altering manufacturers coupons? Then I got the old, “you can’t use a coupon on a RR item” and of course, “you can’t pay with a RR on an item that produces a RR” Again, I stood firm and then he said, “Well, if the RR doesn’t print, I can’t do anything about it.” I simply said, “I understand”. They printed. I left. I did end up writing a letter to the district manager about my history with this management team. It made me feel better even if nothing is done. We’ll see. The DM said he hadn’t seen that before, but, he inteprets it to mean, you cannot use any coupons that will make an item free, as in if a toothbrush is $1 and the coupon is for $1, it will not me accepted. the purchase price of the item. So then, my confusion is with the interpretation…if the value of a coupon can exceed the purchase price of the item, would that not be getting an item for Free? I am awaiting a response and will be sure to let you all know when I get it and what it is! i called rite aid corporate TWICE last night about 2 different stores! both store managers yelled at me for “trying to get things for free” – um, of course im trying to get things for free!?! was my response. i stayed calm and explained to them their coupon policy, and even had a copy of the policy with me (unfortunately is doesnt say anything about the $5/$20 video value coupon being used before any other coupon! ), but they both refused to believe that i could use a manufacturers coupon and a rite aid coupon on the same product – and i could do it on each item even if it is BOGO free. then, one of the managers started making up his own policy telling me internet coupons were 1 per customer, even if it doesnt say it on there. Then he accused me of photo copying all of my coupons. it was horrible, and by the time i got to my car (with no purchases) i was doing everything i could not to cry. i called 1800 rite aid just to make sure i wasnt doing anything wrong and they assured me everything i explained to them was right. so why do i feel like a thief? how do we get these cashiers and managers to know and learn about their own coupon policies? as a coupon shopper it is my job to find best deals for my family. as a rite aid employee i feel it is their job to know the policy. anyway, i just wanted to share and see if there was any feedback out there…. i feel ashamed for some reason. 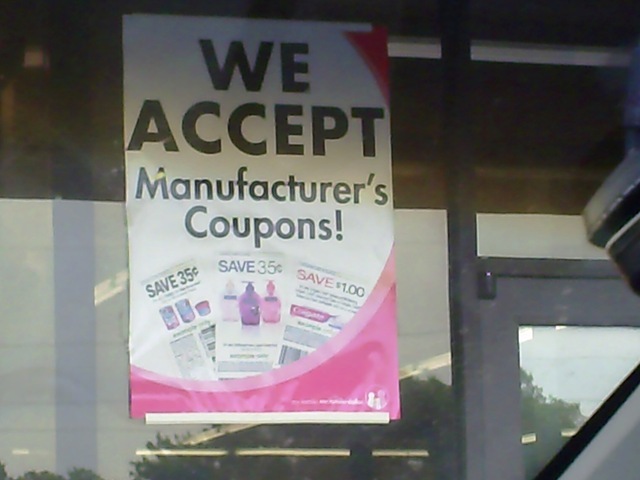 i dont want to give up my couponing, i love it, but now im almost scared to step foot in these stores again! ps i love you site! thanks for all your hard work. yes! please let us know how it turns out. i found out today that DM’s arent always right too! the Dm from rite aid called me and told me that at rite aid, i could not use a bogo coupon on a bogo sale to get both items for free and just pay the tax. i would have to buy 4 items and get 2 free. i told him that he was wrong and that it clearly states otherwise in their coupon policy. He then told me that the Loss Prevention Department called and told him to not do that anymore. then he called corporate and they told him that he was wrong, and that whoever from loss prevention told him that was also incorrect because they believe that even though the customer gets both for free, the store is reimbursed from the manufacturer for one. rite aid doesnt care whose money they get – mine or the manufacturers. the corporate customer service department is now sending a memo to all DM’s and stores in my area explaining in full detail that there will be no retaliation to managers or cashiers for excepting coupons and to have formal inservices to discuss coupon policies! i hope that helps me and all my fellow coupon shoppers in my area. thanks for letting me vent! @jaidee: Thank you for sharing, I think we can stand our ground without being rude and get the cashiers and managers better training. It will benefit them and us in the long run.